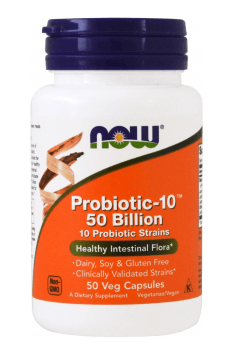 Now Foods Probiotic-10 is a supplement supporting natural bacterial flora, which provides as much as 50 billion living bacteria in one capsule. Efficient functioning of intestinal microflora ensures hermetic intestinal barrier, protecting the whole organism from pathogens and anti-nutritious factors, which results in the efficient functioning of almost all the systems of the human organism. In probiotic therapy, the largest problem is proper selection of bacteria strains, adequate to the current needs of the organism, not only due to specific effect of each of them, but also according to the peculiar changeability of the composition of intestinal flora of each of us. The producer of the supplement solved this problem applying in the preparation ten most popular and most frequently used in supplementation bacteria strains. Lactobacillus acidophilus – a bacterium naturally occurring in milk products and in the human organism in the digestive tract and reproductive organs. In the intestines it is responsible for carrying out lactic acid fermentation. It also takes part in the production of vitamins from group B.
Bifidobacteriumlactis – a bacterium present in mother’s milk and in this way colonizing the intestines of the human right after birth. It supports regeneration of intestinal villi, especially effective in the therapy of irritable bowel syndrome. Lactobacillus plantarum – in the human intestines is responsible for carrying out lactic acid fermentation and gelatin breakdown. It supports the immune system and controls the secretion of antibodies IgE. Lactobacillus casei – lactic fermentation bacterium, which plays an important role in the human organism in supporting the immune system. Research suggests that it shortens the time of treating inflammations in the intestines. Lactobacillus rhamnosus – especially effective in the process of body fat reduction, increases insulin sensitivity, regulars appetite, decreases the risk of diabetes. It increases the tightness of intestinal barrier and inhibits the growth of pathological bacterial flora. Lactobacillus paracasei – increases the efficiency of enterocytes. It limits the absorption of pathogens in the digestive tract. It is used as support in the therapy of stomach ulcers and duodenal ulcers and is also considered an effective form of prophylaxis of these diseases. Bifidobacteriumbreve – a bacterium exhibiting an important therapeutic effect in the irritable bowel syndrome. Studies indicate limited occurrence of constipations and bloated stomach during the supplementation with this strain. It is helpful in treating diarrheas. Streptococcusthermophilus – supports sugar metabolism, is able to metabolize lactose and saccharose. It produces urease, an enzyme carrying out the reaction of urea hydrolysis. Lactobacillus salivarius- produces lactase, which enables lactose digestion. Regulates pH of the digestive tract, enabling proper colonization and the development of natural bacterial flora. Bifidobacteriumlongum – reduces the level of cortisol in blood, which is a stress hormone having a negative influence on metabolism. It also shows antidepressant and anti-inflammatory effect. Due to the influence on the psychological functions of the human, it is classified to the group of bacteria, colloquially called psychobiotics. Now Foods Probiotic-10 is a complex support for natural bacterial flora. It allows not only to derive benefits from well-functioning, tight intestinal barrier and efficient erythrocytes, but also to support certain functions of the organism thanks to the autonomous effect of each of the ten bacteria strains present in the product. Probiotic-10 50 Billion 50 caps. Proper storage of the product should be borne in mind, i.e. it should be stored in cold and shaded place. Probiotic bacteria are relatively sensitive to environmental factors and exposing them to excessively high temperature will lead to the death of bacteria cultures. Storing the product in the refrigerator, as suggested by the producer is the most reasonable way (although it is not absolutely required). 1 capsule a day will be a sufficient portion on a daily basis. In the periods of the increased burden of the organism, it is recommended to increase to dose to two capsules a day. During and after antibiotic therapy even 3-4 capsules a day may be used.